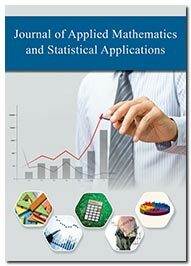 Journal of Applied Mathematics and Statistical Applications deals with mathematical methods and techniques applied widely in science, engineering, business, computer science, and industry. Since applied mathematics is a combination of mathematical science with a specialized knowledge, the journal prominently projects related domains like statistics, which is widely used for the data collection, analysis, interpretation, presentation, and organization of data. The main aim of the journal is to publish the most advanced research and discoveries with current developments in the form of original research articles, review articles, case reports, short communications, commentaries, images, video articles, etc. in all areas of the Applied Mathematics and Statistics. By making our content freely available online, the journal try to meet the needs of aspiring researchers and scientists throughout the world give them a scope for further advancements. Mathematics is a broad discipline with an application oriented potential to address several problems in engineering, sciences, and business through mathematical, computational and statistical tools and techniques. It includes Dynamical systems and differential equations, Mathematical physics, Computation, Information theory and signal processing, Probability and statistics, Operations research. The journal thus covers a wide range of topics include but not limited to - Applied mechanics, approximation theory, computational simulation, control, differential equations, dynamics, inverse problems, modeling, numerical analysis, optimization, probabilistic and statistical methods, stochastic processes, mathematical and computational logic, calculus, Analysis, applied Mathematics, quantity, space, change and structure, computational Model, differential transform Method, dynamical systems, Integrated Analysis, Three dimensional Steady State, nonlinear differential equations, computational Mathematics and actuarial mathematics. Which one shall we use for linear dynamic panel models: GMM or IV?